And farro, a nutty-flavored, ancient whole grain, serves as the star in this nutritious salad, making it a perfect option for a satisfying side dish or meatless entrée. 1. In a 1 ½-quart saucepan, cook the farro in the chicken broth, covered, for 20-30 minutes or until the farro is tender but chewy and the liquid is absorbed. Transfer to a salad bowl. 1. Meanwhile, in a medium bowl, whisk together orange juice, olive oil, orange zest, honey, mint leaves, salt, and pepper until smooth. 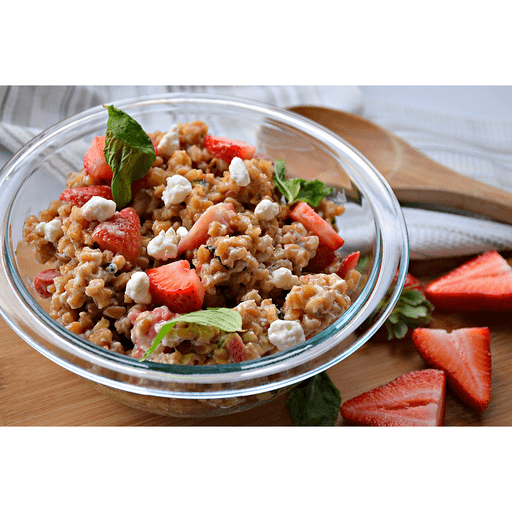 Pour the dressing over the farro and add the strawberries, goat cheese, and walnuts. Toss until all the ingredients are coated. Serve cold. For vegetarian: Use vegetable stock in place of chicken stock. Calories 300, Total Fat 16g (Saturated 3g, Trans 0g), Cholesterol 5mg, Sodium 410mg, Total Carbohydrate 31g (Dietary Fiber 4g, Sugars 7g), Protein 10g, Vitamin A 6%, Vitamin C 30%, Calcium 6%, Iron 10% *Nutritional values are an approximation. Actual nutritional values may vary due to preparation techniques, variations related to suppliers, regional and seasonal differences, or rounding.